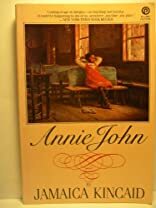 Annie John A Novel 1997 publication. About Jamaica Kincaid (Author) : Jamaica Kincaid is a published author of young adult books. Some of the published credits of Jamaica Kincaid include Lucy, Annie John.